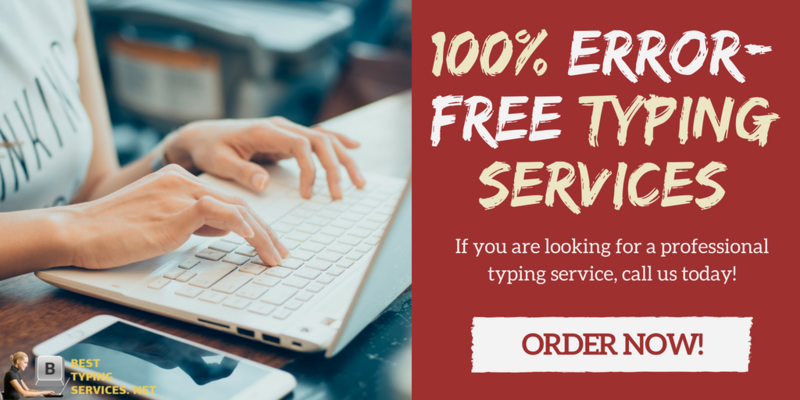 Why Do You Need Typing Services for Authors? Many authors prefer the feel of pen on paper or even a traditional typewriter when doing their work. This is fine but unfortunately, the publishers will want the writing typed into a computer in a format that they can use. So once you as an author have finished your writing you will have to get your work typed up. Doing this yourself can be a very lengthy task and one that you will not want to waste your own valuable time on. This is why you will want to use professional typing services for students such as ours for all of your typing services. 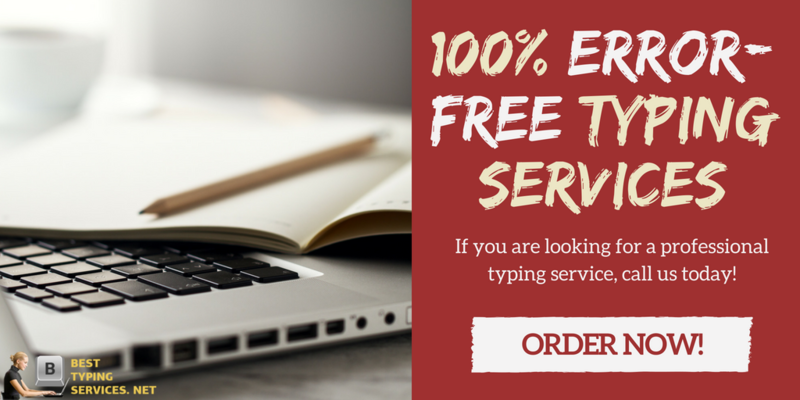 What Can Author Typing Services We Provide for You? There is a host of areas in which our typing services will be able to provide you with support. Our services use only highly qualified and experienced professional typists that can work from handwritten or typed notes or even dictation. Once you have completed the writing of your fictional masterpiece we can provide you with a typist that is highly experienced in typing of books to work with you. They will understand the formatting requirements of your publisher and even the requirements for correct formatting if you aim to self-publish your work. Typing a book in many areas of nonfiction may require additional skills in the area of the book that you have written. A scientific book, for instance, may require the use of different software such as LaTeX to handle the formatting of complex equations. While a medical of the legal book may require a full understanding of the subject area if the typist is going to recognize the terms being used to perform accurate typing. We always ensure that our services provide the best and most appropriately qualified typist for the job. Typing scripts can have some real challenges with regards to formatting. Our services can provide you with the skilled and experienced typing staff that are required to ensure that your script is produced exactly as you want it. One of the greatest impacts that the internet has had for authors is the ability for an author to bypass the publishing houses and directly publish their works online. We can offer services that will not only type you works for you accurately but also ensure that they are perfectly formatted for the specific route you wish to use for publishing. Not all authors are looking to publish a book, many times you may be writing a lengthy article for a journal or some other publication. Our expert typists can help to ensure that your writing is not only typed correctly but also formatted to meet their specific submission criteria. If you have written a screenplay or even a corporate training video you may just want to ensure that the video is also subtitled correctly either directly from the script or using the actual soundtrack. We use expert typists that are highly familiar with producing subtitles in the correct format that are broken down correctly for the audience to be able to read. Your handwritten or spoken text may not always be correct. You may have used poor grammar, incorrect words or it may just simply need to be written in a more effective way. Our author services can provide you with far more than just simply typing. We offer free proofreading as standard to avoid written errors as well as also offering a full-blown editing service to improve your writing. Why Do You Need Typing Services for Surveyors? A surveyor makes their money through conducting surveys and inspections, not through spending their time sat in the office typing up the reports. So outsourcing the typing up of their normally dictated notes as they conduct their work is going to free up their time and allow them to earn more money. As well as eliminating an often tedious and time-consuming task that few enjoy. However, finding transcription typing services in this field that you can trust to do the work is not always easy. There are many services out there that will offer to do the work but without specialist knowledge of the industry will they be able to do the job accurately. A typist that offers digital dictation typing services for a surveyor needs to be able to tell the difference between for instance battens and batons. We offer a specialist service through typists that are highly qualified and experienced within your industry ensuring that your typing is done accurately, quickly and without any embarrassing mistakes. How Can We Help with Surveyor Typing? There are many different reports that a surveyor is asked to provide and we can help you with typing them all. We can use standard templates for the reports or your company specific layouts and will be able to use your dictated or even had written notes to produce your reports in an accurate manner within the time frame that you require. While these reports are for the benefit of the lender they are paid for by the house buyer; many of whom do not realize that it only seeks to see if the house is roughly worth what the buyer is paying. Our services can ensure that your reports are correctly formatted and accurately typed to avoid any issues. This survey is far more robust, however, it will not do things such as lifting up floorboards and delving deep into the attic to search for issues. Our experts know exactly how to place your findings into the relevant sections of the report. Usually, the most comprehensive survey that will be undertaken to highlight any issues with a property and one in which no stone is left unturned. Our experts will know exactly where your comments belong within the full report. A snagging survey can often be a lengthy document for a brand new build and can cover everything from uneven painting and scratches on doors to more serious issues. Again our experts will provide you with a quick turnaround on your report and can ensure perfect formatting to your requirements. Often a surveyor will be hired as an independent set of eyes to oversee the costs involved in construction. Our typist will be able to help you with the many different types and formats of forms that may be required within this area. There are many times that a dispute regarding a property could require a surveyor to provide their expert and independent view. Our typist will quickly and accurately provide your report using the specified requirements. No matter what type of report you need completing we have the experts that are able to take your recorded or handwritten notes and place them in the correct place to create a well formatted and concise report. We offer on-time delivery and quick turnaround and cover everything that we do through our full satisfaction money back guarantee. You can read more about our copy typing service at any time. From typing up a CV to business reports or dissertations you will find many different CV typing services that are there to help you save time and money with your typing. Our typists are chosen for their relevant qualifications and experience and have proven themselves many times over in the 5 years that we have been in operation. Our work is always highly accurate, delivered on time and proofread to eliminate writing errors. We also provide you a full satisfaction guarantee with our typing services or your money back. So, if you want to work with the best typing services for authors to guarantee that your manuscript is accurate and perfectly formatted just contact our services here today!